Sometimes I think social media is a terrible thing but when it works well it is a truly brilliant way of communicating information between like minded people. In my case mostly foodie related! As I’ve said before I’m now shopping for my parents on a weekly basis so I’m having to visit a supermarket regularly for them. The advantage for me is the free yeast from the bakery counter – the disadvantage is I’m tempted to buy some of the items we find tricky to source elsewhere. I still get as much as I can for us from the independents like the farm shop, the butcher, fish stall etc and I make the most of my pantry to ensure nothing goes to waste. So when I saw a couple of my Twitter friends “talking” about the #expressyourshelf initiative I had to ask questions and read more about it. “Each year UK households throw away 7 million tonnes of food and drink, more than half of which could have been eaten! Busy lives get in the way, making it easy to forget what leftovers we have on our fridge and cupboard shelves”. I used to think that was people who don’t need to budget but having watched Eat Well For Less it’s obviously not the case. My ethics are more to do with guilt to think of us throwing food away when others are going hungry. What a sense of achievement to make a meal from seemingly nothing – I love it! 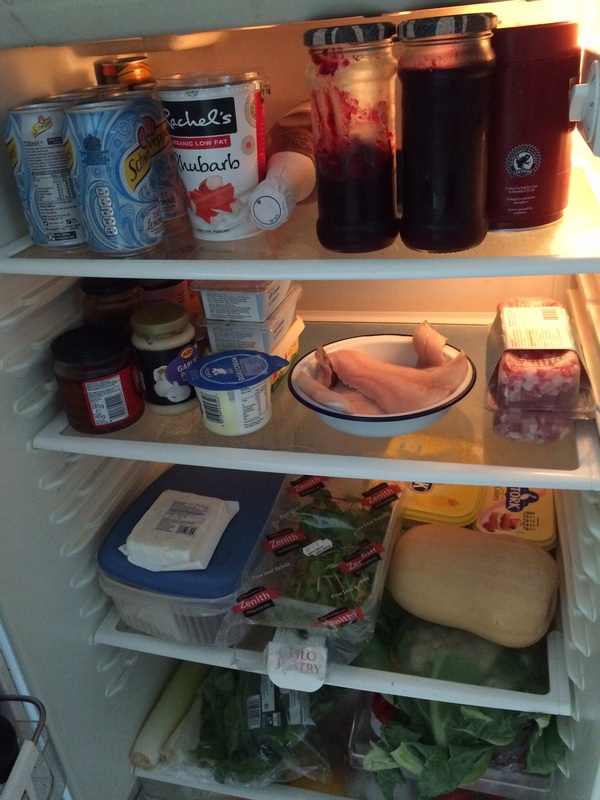 On the top shelf – lemonade, yogurt, homemade damson jelly, Mr W’s coffee stash. Next shelf down – Cheddar and Cheshire cheese in the blue box, Feta on the top, half a box of watercress, Filo pastry, butternut squash, behind a margarine tub – one with margarine for baking, the other contains fresh yeast. 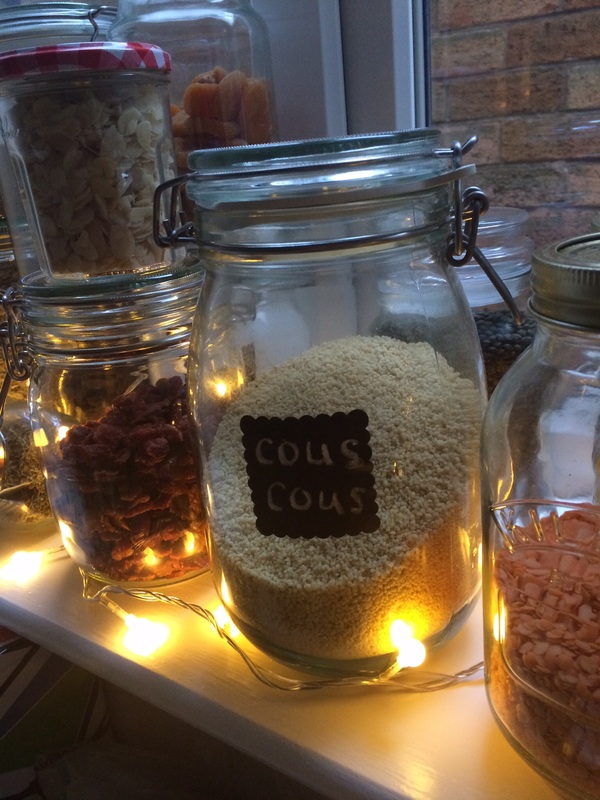 Couscous, rice, lentils,pasta, flours, sugar, chickpeas, cranberries, apricots, sultanas, chocolate chips, various nuts. We get most of these (except the sugars) from the Unicorn Co-operative in Chorlton. They buy in bulk and bag it up so it’s really good value especially things like dried fruit and sea salt. I’m trying to empty a small freezer in the garage so I can get rid of it so in my tiny freezer in the fridge is a homemade Rye loaf, tiger prawns, ice cream, kippers, frozen peas and spinach. So with the addition of some tinned fish etc in the cupboard I’m going to feed us for the next week with what we have and take part in the #expressyourshelf challenge. I know we are lucky – we have plenty to eat.